Summer puts a lot of stress on us – from the suns UV rays to the chlorine in your favorite swimming pool. Never has it been more important to take care of ourselves, and that includes our hair. Too much swimming in chlorinated pools can leave your hair feeling brittle and dry – and it’s terrible on hair that has been color treated. A quick search on the internet will bring up a wide range of apparent wonder products for your locks, all claiming to give you that just stepped out of a salon glossy shine. But, do you really know what you are putting in your hair? Could some products actually be doing more harm than good? Some studies show that products that include synthetics, such as parabens and sulphates, can actually cause damage and are said to ‘suffocate’ the hair. Artificial products can provide a false impression of healthy hair, making hair easier to brush through and giving a silkier and shinier look. However, the ingredients, such as silicones, have been said to actually damage hair – the feeling of healthier hair is purely superficial. In addition to this, silicones can be hard to wash out, as you continue to use products containing silicones, the residue builds up and can gradually damage your hair rather than protect it. So how can we protect our hair? Most people subject their hair to daily heat from hair dryers, straighteners and other styling appliances. Added to this are environmental factors like sun exposure, pollution and even the cold weather. The best way we can look after our hair is by knowing exactly what we are putting on it. Always check the labels of products and research ingredients that are unknown to you. Better still, try and go as natural as you can. Thankfully there are plenty of natural ingredients you can use, many of which are readily available in your own kitchen or local store. Using a homemade conditioning mask just once a week will greatly benefit your hair. They are quick to prepare and apply and will leave your locks feeling healthy and easy to manage. The costs are kept reasonably low as most times you will be using ingredients that you already use at home. Did you know the oils found in an avocado are very similar to the natural oils produced in our skin? These natural oils are unlikely to be found in any man made product available to buy on the high street or online. Avocado contains the kind of fats that are good for you, however, they are not just for eating – they can play a vital role in restoring the richness and health of your hair. Simply use a ripe avocado and mash it up. Add a tablespoon each of olive oil and honey, and if you want to make it smell nice, add a drop or 2 of lavender oil. Apply the mixture to your hair and leave it in for at least an hour, preferably overnight. Wash it out and style as normal. Another wonder ingredient is coconut. Coconut is excellent for enriching hair with oils – a quick glance at the latest shampoos and conditioners on the shelves will reveal many that are infused with coconut oils. Coconut oil has lots of small medium-chain fatty acids and is able to penetrate into the hair quickly. By using a small amount of coconut oil in your hair you can moisturize split ends and give a healthy shine to your locks. Bananas are also rich in natural oils, potassium and vitamins that help to protect the hair by preventing split ends. Bananas also soften the hair and promote shine, growth and can help to control dandruff. You can simply grab a ripe banana, mash it up and apply it to your wet hair. If you want to turn it into more of a conditioning treatment you can simply add a little honey (about 1 tablespoon) and a little olive oil. Leave on for about an hour (or overnight) and then rinse well. If you struggle with tangles in your hair you will find that this conditioning treatment will make it much more manageable. The use of natural hair care products on a regular basis, combined with drinking lots of water throughout the day, will protect your hair and leave you feeling and looking fabulous all summer long! Going on summer vacation typically means a free pass to eat whatever you want, right? I know that when I was growing up it meant lots of ice cream and rich meals out at local restaurants. But, what if you don’t want to toss your clean eating and healthy lifestyle out the window just because you’re going on vacation? Well, if you’re traveling solo, then it’s easy enough to be mindful, but not so much if you are traveling with friends or family. So, we’ve got some tips to help you stay on track. Since a lot of people skip breakfast, or sleep in on vacation, this is the easiest meal to have complete control over. So, make sure to make the healthiest possible decision when it comes to eating breakfast on vacation. Instead of grabbing donuts or pastries with everyone else, have some oatmeal, fruit or veggie omelet for the healthiest breakfast choices. Just because you’re on vacation doesn’t mean that you can’t get in some workouts here and there. If you’re at the beach, take a job on the sand or do some swimming to get the heart rate up. You can also do something like surfing or stand up paddle boarding for a fun workout. Other things you can do include hikes and just walking everywhere that you can. All you need is a little space in your hotel room to get in a short, quality workout. So, take 10 to 15 minutes and sprint through some jumping jacks, squats, burpees, push-ups and similar bodyweight exercises. This will help you to stay toned and fit while on vacation and ensure that all that hard work you’ve put in before now won’t go to waste just because you’re on holiday. Summer offers a lot of opportunities for lovers or for people who want to go out on a date. Days are long and nights are short, which means lots of time for spending it out with that certain special someone. And with the weather so nice, there’s plenty of things to do outdoors. So, whether you are part of a new couple or a couple that’s been together for a while, take some inspiration from the date ideas below and enjoy a special summer night out with your honey. Get a map and drive off to somewhere you haven’t been to before. This exciting and possibly an opportunity to see new sights and learn more about your community and what’s around it. The best thing about an impromptu road trip is that you can do this at any time and go anywhere your wheels take you. Picnics are not old fashioned. In this era of Skype chats and online interactions, spending some time together in person is probably just what you need. Since a romantic date at a diner is too cliche, a picnic is a breath of fresh air. Fresh air, indeed! Sunbathing is boring. Walking on the beach with the frothy waves drenching your feet is so cliche. However, sweating it up on the beach is a fun way to spend your date. It’s not boring, and your chances of arguing with your girlfriend or boyfriend or spouse at the end of the day are lower, because–hey!–the endorphins. Bring with you some snacks, maybe some light beer. Don’t forget your water and sunscreen. It’s summer. It’s hot. So it makes sense to grab some ice cream and maybe get to know each other or reminisce the good old days as a married couple. The great about this is it’s too casual. You don’t have to wear a dress or a suit. Who cares? Go out there in your jeans, shirts, and flats or slippers, and just grab ice cream. Maybe too much romance on a date is cliche already. People just want to have fun, and one way to enjoy a date together is to go a food festival and try different foods. Isn’t that exciting? Jostle your way to the buffet table from booth to booth and try different cuisines. This is a great opportunity to taste food from different regions. Everyone likes to eat, or at least gets hungry at some point, so going to a food fest is never bad option. Instead of a wine toast at a lavish hotel, why not make it a little different this time? How about wine tasting at a winery? This is not your ordinary wine toast. At a winery or vineyard you get the opportunity to see a wide range of wines and possibly get to see the wine makers work. You think this is too expensive? No way! Wineries offer tastings for as little as $10! Get to know new wines and possibly go home with a few bottles with you. Of course, you’re treated to a scenery of lush grapes and picturesque landscape. How’s that for a summer treat with your date? Summer is the best time to enjoy water sports with your spouse or partner. There are so many options for you. If you’re through with hiking or mountain climbing, water activities offer the perfect relief. And for most of these, you don’t even need any experience. So, grab your partner and get ready to hit the water this summer! This relatively new water sport is taking the world by storm. In fact, these days you see more people paddle boarding than surfing at Waikiki Beach. The reason for this is not only is paddle boarding a lot of fun, but it is easier than surfing. Some boards will even hold two people on them, for an extra romantic time out in the water. So, get yourself one of the affordable stand up paddle boards and you’re ready to go. For those who don’t like to get wet, then boating, sailing, or canoeing are the right choices. Boating can be a great way to add a different flavor to your usual adventure dates. Just be together alone paddling your way across the water. You need to have strong arms for these activities, though. If you’re beginners, don’t start with the rough waters. Choose a lake or a gentle river. Anyway, check out some of the best boating spots in the country including Marina del Rey (California), Newport (Rhode Island), Key West (Florida), Lake Havasu (Arizona), Seattle (Washington), Benton County (Arkansas), and Otter Tail County (Minnesota). Swimming is a great way to stay fit this summer, but stay away from the pool resorts, and go out there in the wild for the extra adventure. Top destinations that come to mind for swimming are Little River Canyon, AL; Carlon Falls, Yosemite National Park, CA; Echo Lake, Mount Desert Island, ME; Cummins Falls, Cookeville, TN; The Blue Hole, Wimberly, TX; The Homestead Caldera, Midway, UT; and Chena Hot Springs, Fairbanks, AK. Diving adds a whole new experience to you as a couple. You know what they say. You have to go adventure together and build memories. One of the memories you can build together is those you do together and witness while diving. It can be an intimidating experience, but don’t go to too deep if you’re both first timers. Spots that come to mind include Wooden Fingers (Baranof Island, Alaska), Browning Wall (British Columbia), Sea Lion Rookery (Los Angeles), Metridium Fields (Monterey, California), and Kelp Forest (Catalina, California). After your first snorkeling adventure, you may find yourself wanting to do it again. But be careful if it’s your first time to do it. Mistakes are common among beginners. Anyway, it’s fun and easy. You don’t need a lot of training for this. You and your partner will enjoy this one as much as the others do. Top snorkeling destinations are mostly Hawaii and Florida. Summer is the best way to get wet. Whether you want to stay fit or you want to get started with a fitness regimen, it makes sense to try water aerobics. Unlike plain aerobics in your backyard, water aerobics has an added element, the water itself, that provides resistance. More resistance means more muscle workout and more calories burnt. And why should you do it with your girlfriend or boyfriend or wife or husband? Well, isn’t fun to get fit together? Fishing with your partner is one of the most relaxing things you can do. If you don’t like strenuous activities like rafting or surfing, then you can just hop on a yacht or a raft or perhaps stand on a bridge and just go fishing. You can teach your girlfriend or husband how to catch a fish, or you can try learning for the first time together. It’s absolutely fun! Wonder where you can spend a nice time fishing? Try Glenwood Spring (Colo.), Traverse City (Mich.), Minocqua (Wis.), and Bend (Ore.). Of course, there are a lot more great places out there, so go check them out. If you are heading to the beach or the lake this summer, then skip the kayak, jet ski or other water sport activity and set your sights on stand up paddle boarding or SUP. The cool thing about SUP is that pretty much anyone can do it – even kids! It usually only takes an hour or two to master the board and then you can paddle away all on your own. If you are completely new to SUP, then at first glance you might think that it is surfing. While this water sport got it’s popularity in the U.S. from well known surfers, it is actually not as difficult as surfing. Sure, you can try riding some waves on your paddle board, but that’s not what it’s about for most people. With this fun watersport, you remain standing and use a long paddle to get around the lake, river or ocean. Most SUPers stick with calmer waters, but you can certain tackle some waves for added fun. Spending time on a SUP is all about balance. 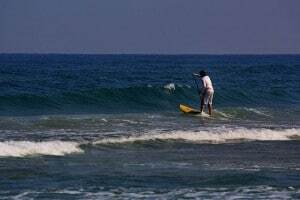 In fact, this is why many people do SUP yoga, which is quite impressive when you see someone doing it from the beach. Like any new sport, getting all the right gear can be pricey, but if you are just testing out SUP then there is no real need to go out and buy the necessary items. Instead, look for rentals at the beach or lake. In all the popular tourist areas, you will find places renting out SUP gear. Often, surf shops and scuba shops rent them out as well. Prices to rent all the needed gear varies by location, but on average you’re looking at around $90 for two hours of use with the gear. For those completely new to it, this really only gives you enough time to get the hang of things, so plan on paying for at least four hours. If you decide that you want to purchase some beginner stand up paddle board gear, then your cheapest option is to go with an inflatable SUP. Not only do they offer the lowest price, but they are also ultra portable, which means that you can easily taken it with you on a plane or a road trip, as well as easily store it out of the way at home. In addition to the board, you will definitely need to get a paddle and maybe a paddle leash. Other items that you may want to consider getting include surf booties (very helpful if the shore is rocky or if you are going out over a coral reef), personal flotation device (for safety), and board bag (for carrying and storage). There are other accessories available as well, but you’ll likely only need them if you get serious about paddle boarding. Some of the best places to find bodies of water to SUP in North America include Southern California (like San Diego Bay and La Jolla), Lake Tahoe, the Florida Panhandle, Hawaii, and Puerto Vallarta, Mexico. Once you try stand up paddle boarding, you will find that not only is it a lot of fun, but it is also a great workout. To learn more about how SUP can get you in great shape while you’re having fun out in the water, check out the YouTube video below.